Seemingly lost in all the hubbub over Donald J. Trump’s tweet about LeBron James and Don Lemon has been the noble act that the pro basketball player has committed on behalf of at-risk children in his hometown. Sure, Americans are talking about the president’s racist-sounding message in which he calls Lemon the “dumbest man on television” and how the CNN anchor made James “look smart.” I’ll add that both men, Lemon and James, are African-American. Trump’s insult is in keeping his with his history of insulting African-Americans’ intelligence. The story ought to center on what LeBron James has done for students in Akron, Ohio. He has invested several million dollars of his own immense fortune in establishing a school for those children. Trump, who said in his tweet “I like Mike,” drew a response from “Mike,” aka Michael Jordan, the retired NBA great who endorsed LeBron’s efforts on behalf of the kids. The reality is this: LeBron James has done far more for children in Akron than Trump has done in his entire professional life. I will repeat what I’ve noted already, which is that Trump focused his entire career on self-enrichment. He demonstrated zero interest in public service prior to running for president in 2016 … and I’m convinced that he intended to become president for completely personal reasons. LeBron James’s act of generosity will long outlive the current dust-up over the president’s Twitter tirade and perhaps even the debate over its racist tone. Common denominator with sports figures and Trump? The Hill newspaper has posted an item online that chronicles the sports figures who have clashed with Donald J. Trump. I am struck, as are you, with the common denominator that stands out. All the celebrities are African-American. The sports figures — and I use the term “figures” because one of the men mentioned is LaVar Ball, the loudmouth father of a pro basketball player, LiAngelo Ball — all have gotten into beefs with the president, who has taken to Twitter to castigate them. Is it a mere coincidence that all these individuals are black? Or … is the president singling out these fellows because of their racial background? I hate thinking that the president is a racist. The evidence continues to mount that the president’s worst instincts are proving to be so tragically true. Tension tonight at Trumps’ dinner table? I am probably the only American who wants to be a fly on the wall tonight when the president and first lady sit down for dinner. 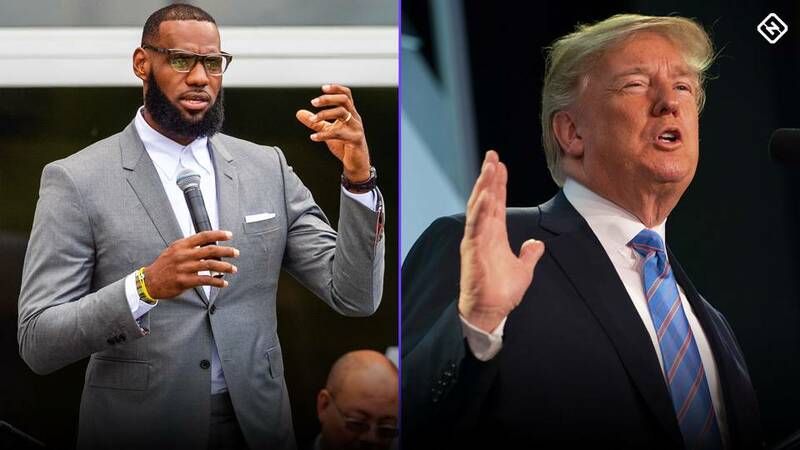 Donald J. Trump decided to post that moronic tweet in which he blasts pro basketball great LeBron James for saying some nasty things about him. Oh, and he also took a cheap shot at CNN anchor Don Lemon, who he called the “dumbest person on TV.” Racist … perhaps? Yeah. Pretty sure it is. Oh, but then first lady Melania Trump’s spokesperson said the first lady salutes James for his work to improve the lives of children. “It looks like LeBron James is working to do good things on behalf of our next generation and just as she always has, the First Lady encourages everyone to have an open dialogue about issues facing children today,” said Stephanie Grisham on Mrs. Trump’s behalf. What has James done? He has opened a school in his native Akron, Ohio, for at-risk children. He has invested a significant portion of his massive wealth to help aspiring students. Indeed, James has done more for children than the president has done. Or for that matter, anything the education secretary, Betsy DeVos, has done. Still, the president saw fit to disparage LeBron James with what many — myself included — have construed to be a racist taunt. The first lady’s minor break with her husband is significant mainly because she has chosen to speak out at all, even if it through her spokeswoman. There might be a bit of tension tonight wherever the Trumps will be. Dan Rather has it right when he lambastes the president of the United States over a ridiculous message sent out via Twitter regarding — and this is rich! — comments from the world’s greatest professional basketball player, LeBron James. Rather, the one-time CBS News anchor, said this, also via Twitter: This is apparently what the President of the United States feels the need to share with the world at what should be long past his bedtime? It’s a disgrace. It’s racist. And it’s the product of petty but dangerous hatreds. I repeat this is the PRESIDENT??!? Trump had posted this message: Lebron James was just interviewed by the dumbest man on television, Don Lemon. He made Lebron look smart, which isn’t easy to do. I like Mike! Yep, the commander in chief, the leader of the free world, the head of state of the world’s most indispensable nation is concerning himself with some comments that LeBron James has made about the president. Did I mention that James has just opened a new school in his hometown of Akron, Ohio, giving at-risk kids a chance to achieve greatness? There. I just did. Or the fact that James is married to his high school sweetheart, has been faithful to her over many years of marital bliss? That, too. Yes, James — as well as CNN news commentator Don Lemon — happen to be African-American. So that means that POTUS, the liar in chief, feels compelled to question their intelligence. Is it just a coincidence, too, that Trump has singled out African-American football players for their decision to “take a knee” during the playing of the National Anthem at the start of football games? I, um, think not. If LeBron is MVP of finals even if Cavs lose … ? 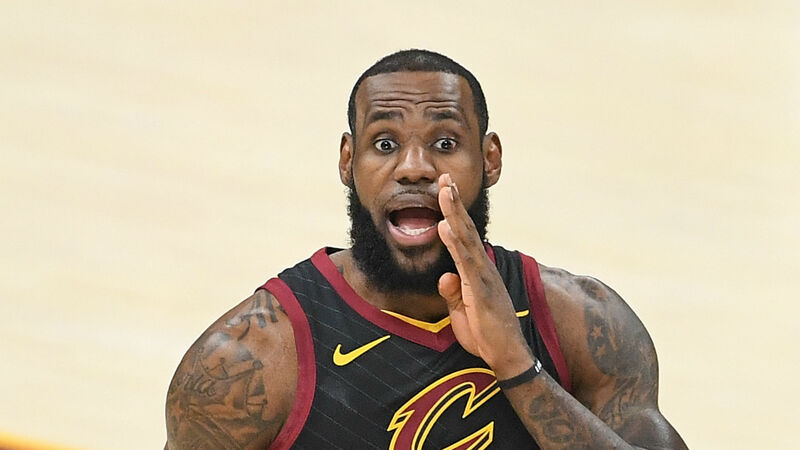 Talk is now swirling a bit about whether LeBron James should be the most valuable player of the NBA Finals if his team, the Cleveland Cavaliers, loses to the Golden State Warriors. There’s precedent for such a thing. * The 1960 World Series ended with the Pittsburgh Pirates beating the New York Yankees on a seventh-game, ninth-inning home run by Bill Mazeroski. The Series MVP? Yankees second baseman Bobby Richardson. * Super Bowl V was won by the Baltimore Colts on a field goal by Jim O’Brien. The MVP of that game? Dallas Cowboys linebacker Chuck Howley. There might be other examples. LeBron James has played his guts out. He’s scored a ton of points. If it goes to the Warriors, he would have earned the MVP — no matter what. How does a teenager who played basketball touch so many hearts? When it’s a young woman with grit, determination and raw courage battling a fatal disease, only to lose that battle … well, that’s how you reach so many people’s deepest emotions. Lauren Hill died Friday at the age of 19. She played basketball for Mount St. Joseph University. It was her dream to play ball and she was able to fulfill that dream. Lauren suffered from brain cancer. Yet she fulfilled her dream this past November when she scored the initial and final basket of Mount St. Joe’s victory over Hiram College. Lauren declared her goal to be to find a cure for the rare form of cancer that took her life. Her courage inspired others to give thousands of dollars to fund research to find a cure. She managed to play a few games for Mount St. Joe before her illness prevented her from playing. Lauren’s courage has become something of a rallying cry for others who are stricken with fatal illness. She suffered from Diffuse Intrinsic Pontine Glioma, which normally affects children much younger. To play the game against Hiram, Lauren had to cope with crowd noise that made her lose her balance. She wore headphones to keep the noise to a minimum when she was sitting on the bench. But her goal was to play ball. She accomplished her mission that day. She also helped raise about $40,000 for The Cure Starts Now Foundation, which she organized. The group’s efforts are ongoing. This young woman was a champion in every sense of the word. And that explains how she touched our hearts. Cleveland, Ohio — the one-time Rust Belt symbol of urban decay, crime and corruption — suddenly has become the most talked-about city in America. And for all the right reasons, to boot. First, the city landed the 2016 Republican National Convention. It’ll take place in the summer, when the weather hopefully is pleasant. Lake Erie will be full of activity. The waterfront will be bustling. Thousands of convention delegates, political activists, media representatives, spectators and vendors will descend on the city, pumping millions of dollars into the local and state economy. Then came news that its Prodigal Son (of sorts) has returned to play professional basketball for the Cleveland Cavaliers. You’ve heard of LeBron James, correct? He’s at this moment the most skilled basketball player on the planet — in many people’s opinion. He said four years he was “taking my talents to South Beach.” He went to Miami and led the Heat to a couple of NBA titles. Now he’s coming back to his home state; “King James” hails from Akron, just down the road from Cleveland. It’s great to be in Cleveland these days. No more jokes about Lake Erie catching fire from pollutants. One more thing: former Texas A&M star Johnny “Football” Manziel is going to play for the Cleveland Browns this fall. That’s not too shabby, either. Cue up the guitars at the Rock ‘n Roll Museum. The city is ready to dance. Will the Heat fans boo LeBron? The NBA’s premier basketball player didn’t do any of that needless publicity stunt work, which he performed when he went from Cleveland to Miami. It was just a simple announcement. Am I going to blather on about what this means for the Cavaliers and the Heat? No. I haven’t a clue. I do like to watch the occasional pro basketball game, but James’s basketball future isn’t high on my priority list. Nor do I know enough about basketball to venture a wild guess on which team benefits from this signing and why. I do wonder about a single aspect of this decision, however. Since James is going home to Ohio — he hails from Akron — the return to Cleveland seems oddly fitting. When he left the Cavaliers to play for the Heat, the fans back home booed the former hometown hero mercilessly whenever he touched the ball during a game in their presence. Will the Heat fans return the favor when the Cavs venture into Miami to play the former NBA champs? I don’t believe so. Nor do I believe they should give him grief. The young man is returning home, he says, to finish his stellar NBA career. What can be so wrong with that? He said that the decision just felt right to him, that he always knew he’d finish his career in Cleveland. You go for it, LeBron. And by the way, I’m actually glad you didn’t treat us to another idiotic TV special.